Today is Thanksgiving. A day to pause and give thanks to the people and blessings we have in our lives. 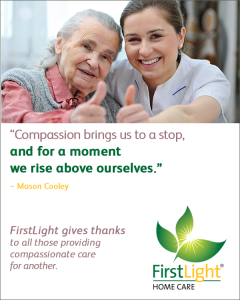 At FirstLight Home Care, we have much to be thankful for. We are most grateful for our amazing caregivers across the United States who are providing exceptional care and compassion to local families. We are also thankful for the more than 40 million Americans who are family caregivers and will spend this Thanksgiving – like every day – placing the care and safety of a family loved one first. We thank them for their hard work, selflessness, dedication, and the ability to love unconditionally. They are a true blessing. We are inspired by the commitment family and professional caregivers give to help those who need additional support or who cannot care for themselves. The work you do and the care you provide is appreciated more than you will ever know.